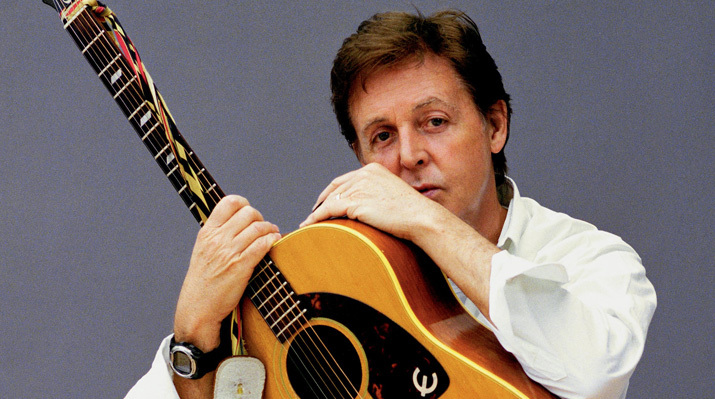 Paul McCartney is probably your favorite living Beatle (sorry, Ringo). Sir Paul himself recently got a full hour on the typically thirty minute television show The Colbert Report, in which he was both musical guest and the main interview. While we won’t be posting a full hour (I mean, other things happened on the show), there is more than your average amount of video worth watching here. Paul performed “Calling Me Back Again,” “Hi, Hi, Hi,” “For The Benefit Of Mr. Kite,” “Listen To What The Man Said,” “I’ve Just Seen A Face,” and “Lady Madonna.” That’s three songs by The Beatles and six songs total. He did a seventh song (and fourth Beatles number), “Birthday,” which can be found online (with “I’ve Just Seen A Face” appearing neither on TV nor online). He also did an interview twice as long as the ones that usually appear on the Comedy Central show. Watch any or all of the Sir Paul clips here after the break. Or see the full episode here.